The Datacard Go Green 534000-003 YMCKT color ribbon kit includes a ribbon that consists of yellow (Y), magenta (M) and cyan (C) color panels for full spectrum printing using varying degrees of heat. The black resin (K) panel is used for text and barcodes, and the topcoat (T) panel is an overlay to help protect the card from scratches and fading. 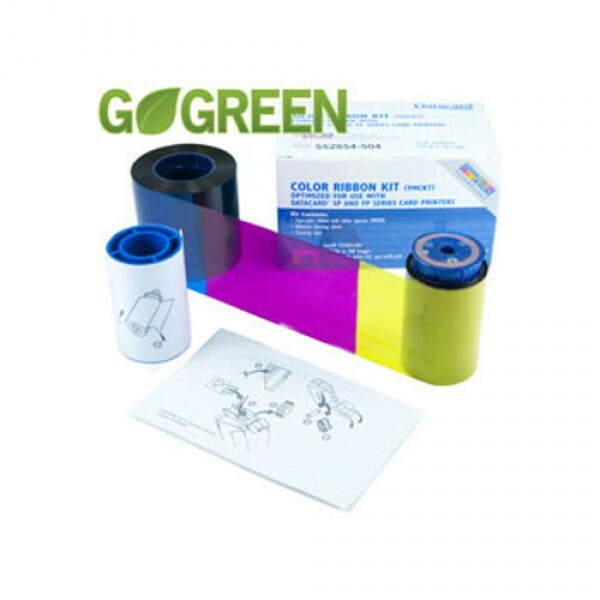 The kit also includes an adhesive cleaning sleeve that picks up debris from the cards before they are fed into the printing cycle and an isopropanol cleaning card, which is soaked in an alcohol-based solution to clean the insides of the printer. This will increase the lifespan of your printer and keep the graphics on your badges looking crisp.